Ever since I was a kid I looked up at the sky in awe. 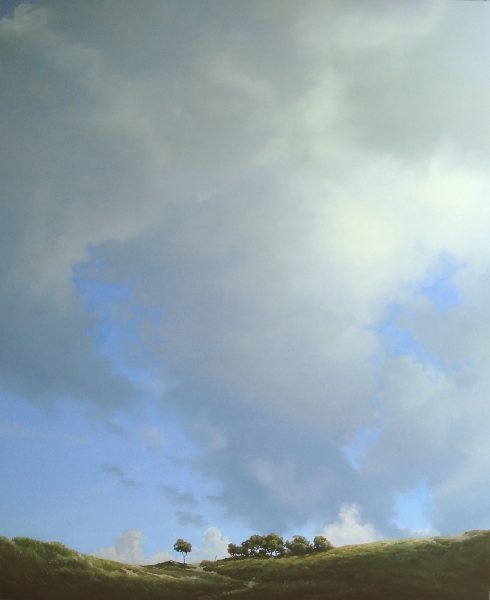 So when I studied art at Minerva Academy (The Netherlands) it was only logic to try and paint skies. 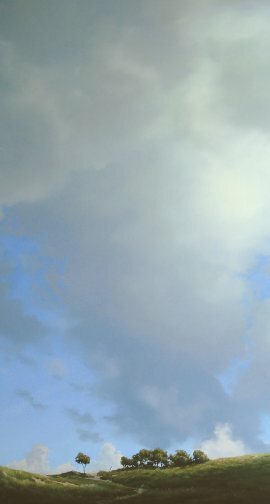 It took me quite a while to paint a decent sky, but studying the old Dutch masters, like van Ruysdael, was really helpful. The starting point of almost every sky I paint is the blue background, light (sometimes greenish) blue close to the horizon and a darker blue higher up in the sky. I start with a light blue (most of the time Kings Blue mixed with Titanium White) and I gradually mix it with darker blues, ranging from Cobalt to Ultramarin to Indigo. I then work the surface with badger hair brushes, to make the transition as gradual as possible.